Recently, evidence was given to believe that the Archaen Confederacy had committed Thievery, and as such, enraged the factions in what seemed to be an uncontrolled and unprovoked riot. Members primarily of the Entei Dynasty assaulted the Confederate Embassy, flooding the waterfalls, burning the flags and ultimately wrecking the décor, to which the Royal Aequus Vanguard retaliated by cutting down the uprising. Peace was short-lived however, when the Dynasty committed a treacherous crime and attempted to raze the SkoRm Federation Embassy for the Federation's assistance in peace keeping on Aequus, by use of explosive material. Repairs have been completed and criminals apprehended. The Dynasty is currently facing trial. On the 603 LC, violent protesters invaded the streets of Aequus and solidified their rage on the Archaen Confederacy’s embassy. The root of the cause is somewhat murky, but most believe that the Confederate government was responsible for stealing a vast amount of high quality goods from the citizens of Aequus. Seers have embedded vision from the later stages of the anarchy into the magicka stone that accompanies this news article. In other news, the Taell’as Hierarchy is officially closing up shop on Aequus and have removed their embassy, authorised by Emperor Yuellas himself. The reason is withheld. 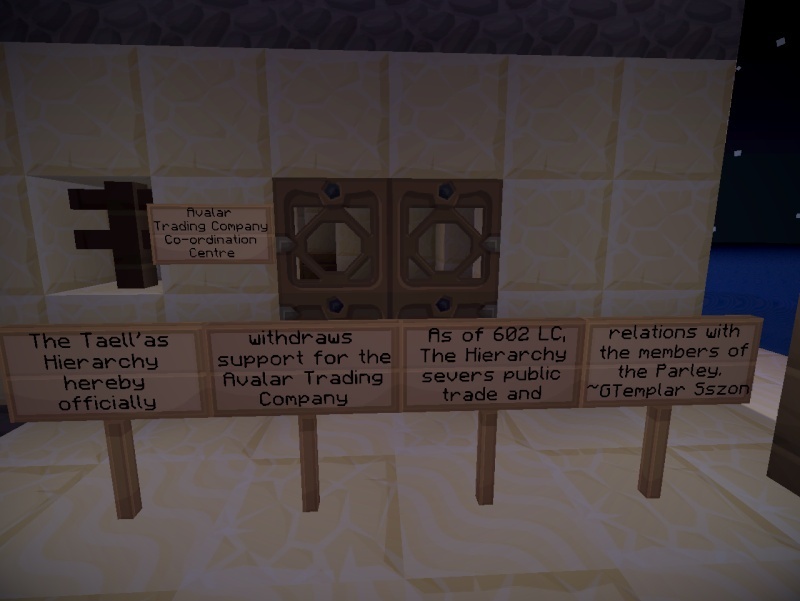 Markets are expected to fall across the world, however, the Hierarchy has released a statement saying that they still lay claim to their signature on the Ratification Parley of Aequus, and are making no attempt to provoke violence in any way. Grand Templar Nenyrrlyn Sszon official states that this is effective as of 602 LC. The expansion rush funded by the Avalar Pedestal Council continues, road networks are growing and Avalar society is flourishing. The Hierarchy is planning increased development over the coming epochs. Suspicions raised - Hierarchy works on a top secret project deep under the surface in a subterranean facility - claim dismissed as “preposterous rumour”. Q: Erith’s time proud crops now grow weak pathetic. Erith’s friends share equal news and Erith is afraid for the time. At now time rate, Erith cannot hope to satisfy the Hierarchy’s need tax with time season’s crops. Erith is not close feeding the family and only time shortly paid for the house. Erith needs assistance help. Is there every that can be work for the fix wheat? A: As of current, Avalar’s wheat fields are suffering abnormal growth, some are even glowing! The Hierarchy is investigating the matter. Their involvement underlines any significance behind this issue and a solution should be expected over the coming epochs. Find your path, your centre and focus on hope. Time is the key to the door. You’ll get through this. The greatest revelations will always turn out to be something you should already know. In retaliation against the Entei Dynasty's capture of Aequus, the leaders of the Triumvirate nation with assistance form the Lupus Monarchy launched a counter attack to reclaim the holy land. The second stage of the operation was to invade the lands of the Entei Dynasty. The armies met little to no opposition, it's garrison nowhere to be seen. The Entei fortress was promptly burned and razed, then the armies returned to their own homelands expecting counter-strikes. Subject: Re: Chaos strikes Aequus!